Today’s blog entry is written by a guest blogger: Travis! If you’ve ever ordered anything from us then odds are Travis assembled it, packed it, double checked it, triple checked it, sealed it, and shipped it to you! I checked the online flyer for my local region to find out the weekend schedule for March 27 and 28. You can get on SCCA.com and then search by selecting “Find your region”. The season began with practice on Saturday and Race #1 on Sunday. Our class, DSP, would race in the afternoon both days. There are morning and afternoon sessions, each with 2 run groups (1 group works the track while the other runs and vice versa). We found out that Saturday is open practice, anyone can run morning or afternoon session and everyone gets 6 runs each session. The weather was great Saturday and we learned a lot, since both of us come from Drag Racing backgrounds. Sunday was rainy off and on but tons of fun and the previous days coaching and practice had us off to a good start. Now before I go on with the weekend recap, I’d like to explain what got Chris and Me to this point. Both of us have raced, mainly drag, and are at least familiar with spirited driving and some technique. A big problem for many people who take up auto racing is that a learning curve can easily resemble a rising cost curve when exploring the possibilities various venues offer. “Pay to Play”, is not an unfamiliar adage, but fun is not always overshadowed by unexpected costs, damage or mental suffering. As some people know Corksport has in the past run a ’99 Protégé at Woodburn and PIR but getting bugs sorted out has been generally been time consuming and occasionally expensive. 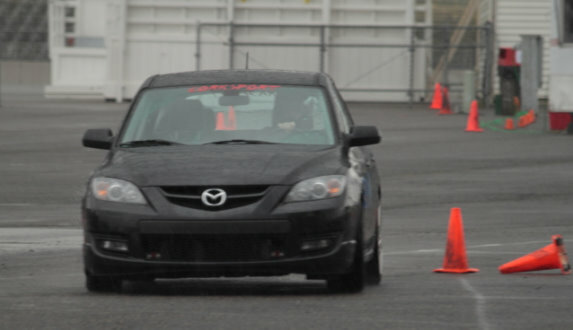 It was decided that Autocross/Solo was more novice and budget friendly. When things go wrong in Drag Racing it tends to make things explode in a huge, expensive way. I would provide the car, my 2007 Mazdaspeed 3 GT, and CorkSport would contribute some parts, a pair of drivers and entry fees. A perfect match. I’ll give racing costs and car details in a later post. I signed Chris and I up for SCCA and used the online rule book to find a class the car would fit in. I had read some forum posts in the past and had a pretty good idea what class we would end up in. No surprise, the car would be in DSP (D Street Prepared), not terribly desirable for a couple of novices but oh well, we would not go blindly into this new endeavor. I contacted a friend who has been racing for many years and got him to agree to some personal coaching for the practice day on Saturday. A few extra hours after work to prep the car and Chris and I are ready for the season to begin. I’ll post details on fees and expenses along with the cars setup and, of course, the results of our first weekend next time.